← You don’t eat what?!? I am sure that is what you are going to say when I mention shiso again. Seriously, if you had the over-abundance in your yard that I do then, let me tell ya, you’d be talking about it (a whole lot) as well. Beyond what I was whipping up in my past shiso post, I have continued to experiment with a multitude of beverages, both cocktail and non-cocktail form. 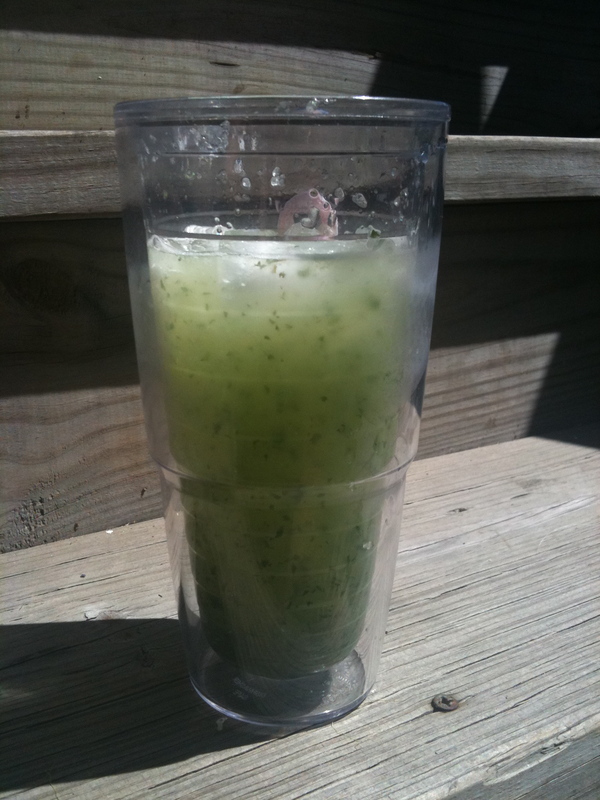 Hello shiso, cucumber, lime aqua fresca, which so so quenches the thirst. But gotta say, doesn’t really make a dent in the shiso crop. Hum, what to do, what to do? Well my basil crop was for *^%# this season (still trying to figure out why, I mean it loves the heat and is related to the darn shiso and mint) which means no stock-up of basil pesto this season. Oh, but back to what I just said, shiso is related to basil, sooooooo Shiso Pesto! 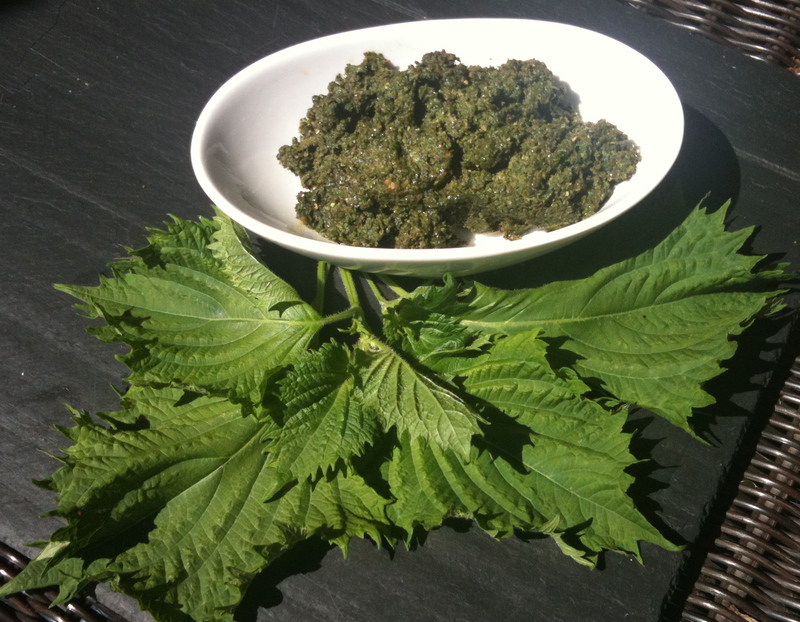 Just a bit of tinkering, and reading what others are doing (yes, I am not the only one in the world that has been taken over by shiso), and I think I have come up with a pretty tasty substitute for the traditional basil pesto. Great in pasta, which any leftover (pesto pasta) makes a rockin’ frittata the next day, or pretty darn good stirred into veggies or a tomato salad. Whirl everything, except the olive oil, in a food processor (yes, when you have as much shiso to turn into pesto as I do, you forego the mortar and pestle route). When combined start streaming the olive oil in until desired (yours not mine) consistency is achieved. Store in a sealed jar in the fridge or in ziplocks in the freezer – yep that equals shiso pesto year round. This entry was posted in To Market with Mo and tagged Andersonville Farmers Market, aqua fresca, Chicago Area farmers marekts, Chicago Farmer's Markets, Evanston Farmer's Market, Farmers Markets, fresh seasonal organic produce, Glenwood Sunday Market, Green City Market, Henry's Farm, Shiso, shiso pesto, to market with mo. Bookmark the permalink. I’m right there with you!! My basil didn’t fair that well either and I have NO IDEA why. Stinks. I hate having to buy basil – tastes so much better when I grow it. Kim, well if you need shiso, come on over! 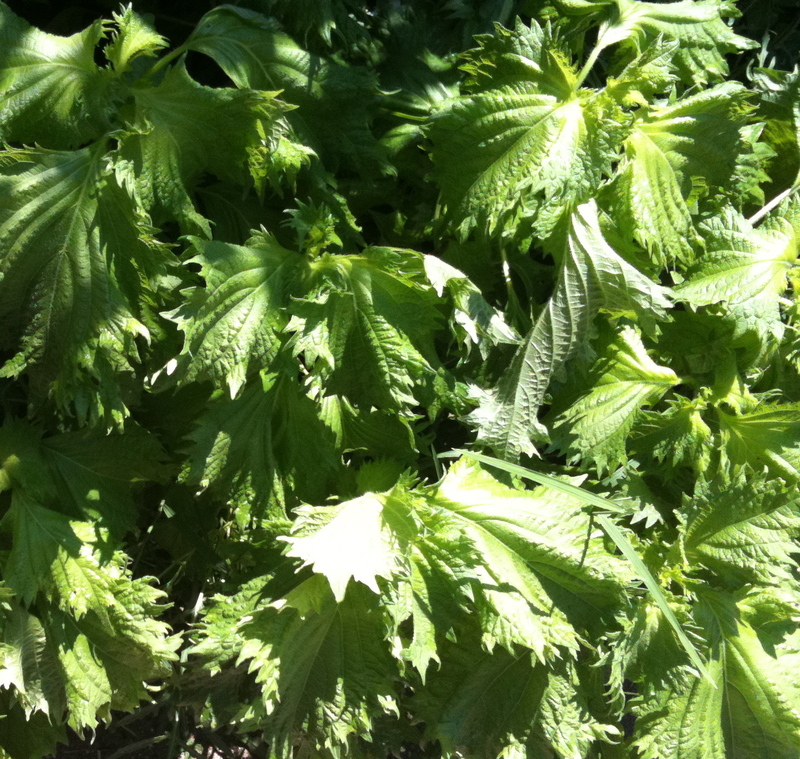 Mo: Do you think that this Shiso would be good in a crepe? hum, interesting….why not? Ben could start a whole new trend. want some?